From the fenced dirt parking lot, we followed the hand painted signs pointing the way to Bulungula. Lugging our daypacks and rolling our small suitcases behind us, we walked the 500 meters to the lodge along a narrow dirt path, bordered by green colored huts to our left and the steep rise of a hill to our right. We found the lodge at the end of the path: a rectangular building painted turquoise on the outside, brightly painted on the inside. Futon couches surrounded low tables, pillows littered the floor near a book case, large picture windows brought the ocean and the river inside. In the main lodge we found the kitchen, complete with communal refrigerator, a cooking area for guests and a separate kitchen for the village chefs. 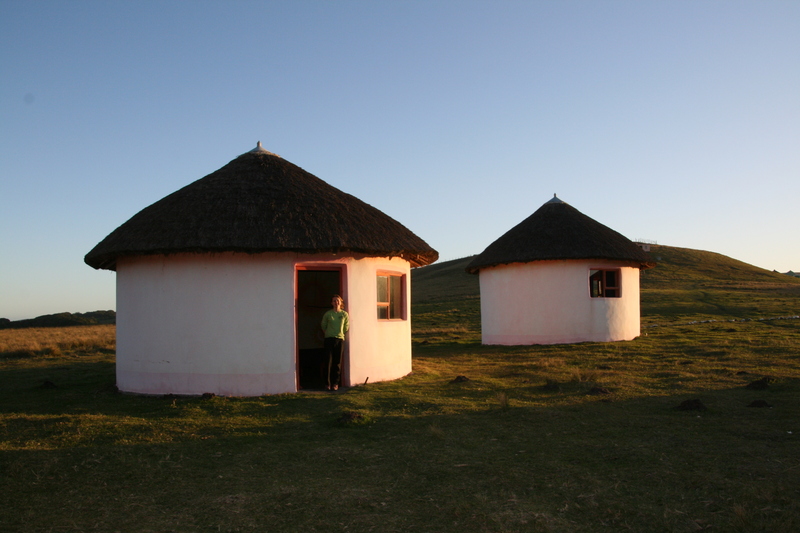 A young woman of the village, Andiswa, showed us our room, a peach colored rondavel where the four of us slept on futons. Down the path, between the main lodge and our hut, were the bathrooms, one hut for the composted toilets and another for the rocket showers. 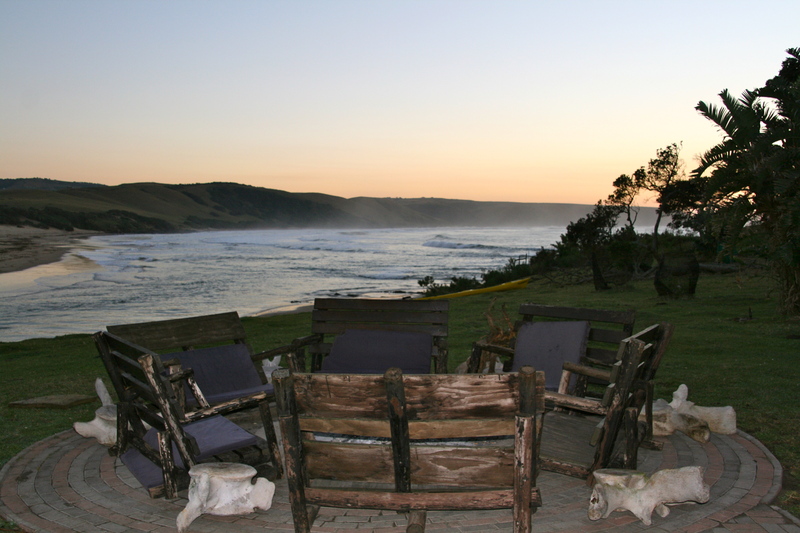 During our 3 days, the boys in our family chose to fish in the surf while the girls learned to grind maize; the four of us paddled the Xhora River, sighting kingfishers and mangroves. We ate curried butternut squash and chicken crepes for lunch, the only diners in the local restaurant’s rondavel. We sat around the fire in the evening, walked along the beach at sunrise and took a village tour. Andiswa introduced us to the healer of the village. We watched village children dance and sing. We learned about the local customs, watched children playing soccer, tasted sorghum beer and walked back to the lodge in the moonlight. Over dinner, we joined other guests and the owners. We met backpackers, families from Colorado and France, and doctors from South Africa who were volunteering their talents and efforts to help the people of the local villages. We learned about the new preschool and the Bulungula Incubator, a non government organization (NGO), and its efforts to improve village life in the areas of education, health and nutrition, sustainable livelihoods, and basic services (including water quality and access to electricity). There are things we didn’t do, like horseback riding on the beach, hiking, gathering herbs with a local healer, swimming in the ocean or trying out the solar shower. Next trip we’ll spend a week at Bulungula.